1. Cut off the stalk end of the aubergines then slice them along their length about 0.5cm thick, discarding the two outside slices. Although this takes a while to make, it's mostly just construction and the result is worth it. Lovely summer meal with a salad and crusty bread. Apologies for lack of quantities in the recipe, but the proportions are not critical. 2. Lay them on a baking sheet, brush with olive oil and grill to soften but not colour the aubergine slices. Preheat the oven to 200C. 3. Lay one slice on a board, spread a little pesto on one side, add a slice of mozzarella at one end, plus a few shreds of sundried tomato, a few basil leaves and a few pine-nuts. 4. 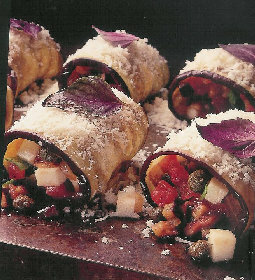 Roll up the aubergine and place it, open end underneath, in an ovenproof dish. 5. Repeat for all the aubergine slices, then sprinkle with the grated cheese. 6. Bake in the oven for about 15 minutes until the aubergine rolls are browned and the mozzarella melted. Note: this pic shows a version where the stuffing is cut into cubes so it's just to give you an idea what the dish should look like! Next time I make my version, I'll photograph it for this page!